The National Life Chain takes place across the country and in Canada on Respect Life Sunday, October 1st. Join us from 2:00 to 3:15pm for a time of silent prayer for our country, for the babies lost to abortion, and for all those affected by abortion. In Winona, the location is Huff and Broadway Streets. Bring your family and invite your friends! Call Kathy Foerster at (507) 313-6880 for questions. Signs are provided. For those outside of Winona, see www.lifechain.net for a location near you. 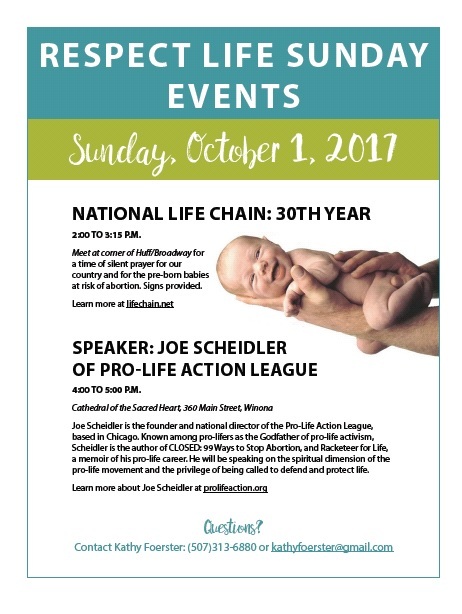 Save the Date - Sunday, October 1st: Joe Scheidler, the founder and national director of the Pro-Life Action League, based in Chicago, will be speaking at the Cathedral of the Sacred Heart on Respect Life Sunday, from 4:00 to 5:00 pm, directly after the National Life Chain event. He will be speaking on the spiritual dimension of the pro-life movement and the privilege of being called to defend and protect life. Dubbed "The Green Beret of the Pro-Life Movement," by columnist Patrick Buchanan and known among pro-lifers as “the Godfather of Pro-Life Activism,” Scheidler has been featured on hundreds of radio and TV programs, has spoken in forty-eight of the fifty states, and motivated many who have become leaders in the fight to restore the sanctity of life. A free-will donation will be taken. Scheidler is the author of CLOSED: 99 Ways to Stop Abortion, and Racketeer for Life, a memoir of his pro-life career. 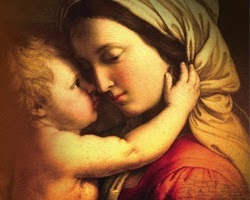 To learn more about Joe Scheidler, see www.prolifeaction.org. Questions on the event, contact Kathy Foerster at kathyfoerster@gmail.com or 507-313-6880.